The addition of 25 million new jobs would bring the number of employed from 152 million to about 177 million workers, which the administration hopes to achieve in ten years. Note that this is a very generous interpretation of the administration’s target, because the Congressional Budget Office (CBO) already projects 2027 employment to be higher by about 8 million, largely due to population growth. In other words, CBO’s projections imply that business-as-usual management of the economy would accomplish one-third of the administration’s goal without any extra effort. Normally when evidence-based policymakers talk about potential new jobs they want to create, they frame this in terms of jobs above already-established baselines. But, let’s grade the Trump proposal on the generous curve I noted above. So if the administration gets 8 million jobs for free, where would the remaining 17 million jobs come from? One simple way to make some progress toward the employment goal is to significantly increase immigration. Given that the Trump administration is more focused on limiting access to the United States rather than expanding the role of immigrants, I can likely dismiss increased immigration as part of their grand plan. 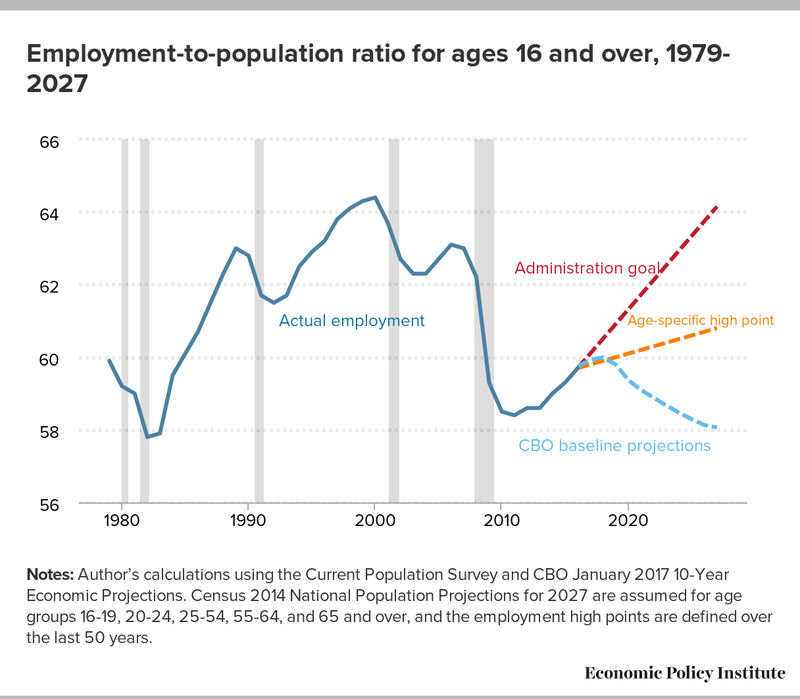 Using the Congressional Budget Office (CBO) economic projections, Figure 1 shows that the administration essentially wants to increase the employment-to-population ratio (EPOP) to 64.1 percent by 2027. At first glance, this might not sound too hard – the United States achieved these rates in the late 1990s and early 2000s. But because the population is aging and the elderly work at much lower rates than younger workers, we naturally expect significantly lower employment rates in the future even if the economy is operating at or above full employment targets. Largely because of demographic changes like the aging of the population, the CBO projects the 2027 EPOP to be only 58.1 percent in that year. Notes: Author’s calculations using the Current Population Survey and CBO January 2017 10-Year Economic Projections. Census 2014 National Population Projections for 2027 are assumed for age groups 16-19, 20-24, 25-54, 55-64, and 65 and over, and the employment high points are defined over the last 50 years. In contrast, Figure 1 also shows in orange an ambitious target that both accounts for demographic changes but assumes each of five broad age groups reaches its historical high point of employment over the last fifty years. Under a bold scenario like this one, although the employed share of the population would grow significantly over the CBO baseline to 60.8 percent, it nevertheless would fall short of the administration goal by more than 9 million jobs. The administration’s goal clearly requires the economy to outperform all of its previous achievements, once we adjust for demographics. Since the American population is aging —the age 65 and over share of the population is expected to rise from 19.3 percent in 2016 to 24.1 percent in 2027—the administration would need elderly individuals to work at much higher rates than they do now. In fact, if elderly individuals are not going to work at rates higher than the one they are working at today, the only way to meet the administration’s goal requires all other groups of workers to attain employment rate gains of 4.4 percentage points above their prior historical peaks, which is probably unrealistic. 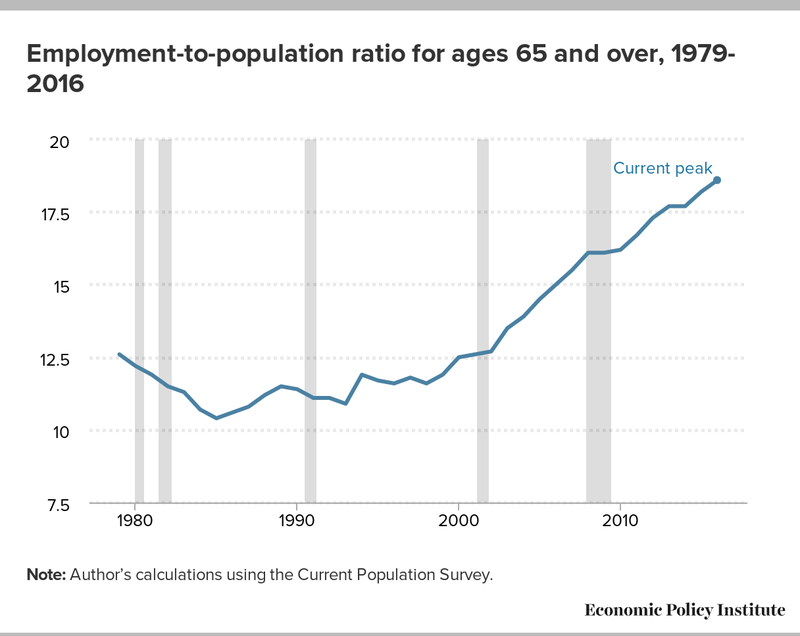 If other age groups don’t raise their employment rates above prior peaks, we would need the employed share of the elderly to soar to 32.3 percent in 2027 from 18.6 percent in 2016. Having the elderly work more is problematic for two reasons. First and foremost are our social priorities: shouldn’t a growing rich country make it easier, not harder, for its older citizens to retire? Second, older individuals are already working more in record numbers. Figure 2 shows the dramatic recent rise in share of the population ages 65 and above that is working. Note: Author’s calculations using the Current Population Survey. Some of the increase in work among the elderly population is due to rising life expectancies and (hopefully) better health among some segments of older Americans. But another important factor is the destruction of retirement savings brought on by the bursting asset bubbles of the 2001 and 2007-2009 recessions. Unfortunately for many of those who planned to be retired, inadequate savings due to a retirement system that does not work for most workers has pushed them into the labor market. As a result, it is as likely the case today that too many older Americans are compelled to work, not too few. Employment goals like the administration’s that are unrealistic at best or exacerbate harmful trends at worst are not a step in the right direction. In the end, the goal of 25 million new jobs likely just reflects simple ignorance of the Trump administration. The United States economy created almost 2.5 million jobs in 2016, so a natural guess for the next 10 years might just be to multiply this by 10. But the 2.5 million jobs gained in the most recent year were buoyed by continuing to work off the excess of unemployed workers created by the Great Recession. Further, the growth of the labor force over the next 10 years will continue to decelerate rapidly. This is the obvious fact that the Trump administration forecasts likely miss.